As we explore the Holy Land you and your family will delight in incredible, mysterious landscapes, hidden wonders and beautiful peoples - all created in God's image. We will travel through the lands of Scripture, discovering familiar Biblical landmarks, such as the possible resting place of Noah's Ark, the remains of the Tower of Babel, the tracks of Moses up to the peak of Mount Sinai. ~ engaging text of a "living-book"
~Prayer Walk for each country. Written for grammar age explorers (gr. 1- gr.6) CD-ROM includes reproducibles in the form of copywork passages, copywork templates, travel log templates, quizzes, maps, recipes and more.279 pages packed with delightful information. From Knowledge Quest/Bramley Books. As we explore the Holy Land you and your family will delight in incredible, mysterious landscapes, hidden wonders and beautiful peoples - all created in God's image. We will travel through the lands of Scripture, discovering familiar Biblical landmarks, such as the possible resting place of Noah's Ark, the remains of the Tower of Babel, the tracks of Moses up to the peak of Mount Sinai. 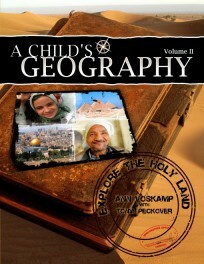 Over the course of 16 chapters and nearly 280 pages of text, explore six Middle Eastern countries with: ~ engaging text of a "living-book" ~Field Notes (narration prompts) ~Travel Logs (notebooking & mapping activites) ~Bringing it Home suggestions that focus on art, music, poetry and food of each country, ~Prayer Walk for each country. Written for grammar age explorers (gr. 1- gr.6) CD-ROM includes reproducibles in the form of copywork passages, copywork templates, travel log templates, quizzes, maps, recipes and more.279 pages packed with delightful information. From Knowledge Quest/Bramley Books.